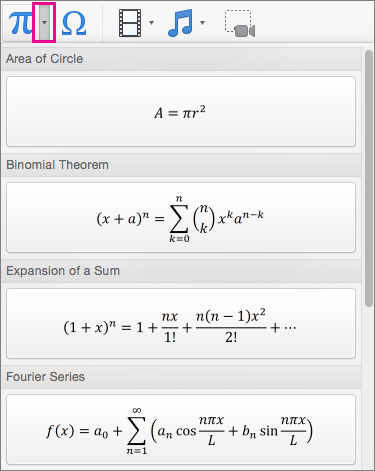 Beginning with PowerPoint 2016 for Mac, you can add equations to your presentation—no formatting required. If the built-in equations don’t meet your needs, you can modify them or build your own sophisticated equation from scratch. On the Insert tab, in the Symbols group, click the arrow next to Equation, scroll through the options in the list, and then click the equation you want. On the Insert tab, in the Symbols group, click Equation. In the Symbols group, you’ll find math-related symbols. To see all the symbols, rest your mouse over one of the symbols, and then click the arrow that appears below the symbol gallery. 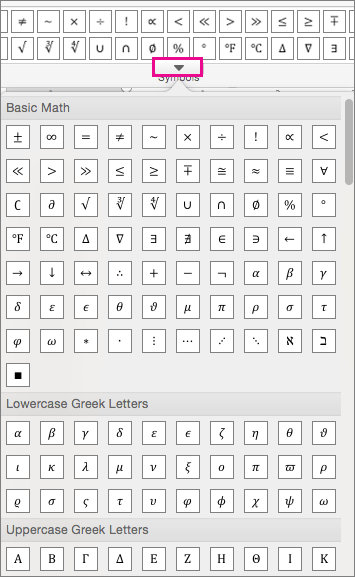 Scroll to see all of the available symbols. The Structures group provides structures you can insert. Just choose a structure to insert it, and then replace the placeholders—the small dotted-line boxes—with your own values. The Tools group lets you control where and how the equation is displayed on the page. The Professional option displays the equation as a two-dimensional value. The Linear option displays the equation so it fits on one line. To edit a mathematical equation on a slide, just click in the equation to make the changes you want. When you do, you’ll see Equation tab appear.